College Football Picks 2010: Wisconsin Looking to Rise in the Big Ten: The University of Wisconsin is ranked #12 in the nation in the 2010 preseason USA Today college football poll but, by the college football picks season’s end, may be no better than the fourth best team in the Big Ten. Vegas odds makers noted the stiff competition in conference and rated the Badgers with 40-1 NCAA odds of reaching the BCS national championship game in Glendale. With a dynamic offense returning 10 of 11 starters, Wisconsin hopes to turn some of those long NCAA odds in their favor this college football picks season. 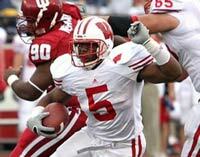 The Badgers, 10-3 in 2009, scored more than 30 points nine times during the year and return key starters in senior quarterback Scott Tolzien, junior receiver Nick Toon, and and junior running back John Clay. Clay finished with more than 1,500 yards rushing and 18 TDs. He and sophomore RB Montee Bell make a dangerous combination running behind a line that averages over 300 pounds. This team will have to score points this college football picks season since the defense is in flux in 2010 and may not be quite as effective. Wisconsin features a pair of sophomore linebackers, Chris Borland and Mike Taylor, who can impact games, but lose their leading sacker, O’Brien Schofield, and do not have much experience up front. Iowa’s secondary, though, offers both experience and talent, which will be helpful against the top QBs in the Big Ten. Bret Bielema, entering his fifth year in Madison, made great strides in last years 2009 college football picks season, especially in conference where the Badgers compiled a 6-2 record, with losses to only Ohio State and Iowa. Unfortunately, he must face those two powerhouses again on consecutive weeks, October 16 and October 23, and must play at Michigan and at Michigan State. Four losses in the Big Ten would not be out of the question, meaning Vegas odds makers might be on the money with those preseason NCAA odds.